The bicentenary of the French Revolution occurs in this year of 1989 [Ed., originally published in 1989]; and still the world is tormented by ghastly political upheavals and acts of terror that are inspired by what was said and done in Paris two centuries ago. English-speaking countries, nevertheless, have been relatively free of such convulsions. One reason for this relative immunity is the impression of the horror and futility of the French Revolution that has been generally held by literate people in Britain, the United States, and other countries with British cultural roots. “The Sensual and the Dark rebel in vain,” Samuel Taylor Coleridge, paraphrasing Edmund Burke, wrote in 1798. “Slaves by their own compulsion!” Such became the judgment on the Jacobins and other French revolutionaries by the English and the American public from the late eighteenth century on. That judgment was confirmed, as the years passed, by certain eminent men of letters much read on either side of the Atlantic. I essay here to examine such comminatory fiction about the French Revolution, with particular attention to four men of letters, two who wrote in English and two who wrote in French. People tend to be moved far more by images than by logic-chopping. The American view of the Russian Revolution has been much influenced over the past thirty years by the films Dr. Zhivago and Nicholas and Alexandra–productions that are both imaginative and truthful. And the more recent French film Danton creates a dreadfully sound impression of how revolutions devour their children. The impression great written fiction leaves on the imagination is not so immediately strong as that produced by films, but it ordinarily leaves a more enduring mark upon the convictions of those who have read such books attentively. Although the novel attained perhaps its greatest influence during the nineteenth century, that form of literature still makes a powerful impression on the reason and the imagination of those men and women who are culturally literate. What important works of fiction worked a healthy reaction against the French Revolution in Britain and America, a reaction little diminished today? Before answering that question, I must define my terms. “The armed doctrine,” in the title of this essay, refers to that fanatic political movement called Jacobinism, the first ideology of our age of ideologies; it was British statesman Edmund Burke who denounced it as such. Britain was combating, Burke said, not merely the power of France, but a fanatic political creed, a kind of inverted religion, preached originally at Paris in a secularized Dominican monastery but within a few years disseminated throughout Europe and even in Britain. This ideology called Jacobinism–overthrowing state and church, proscribing and confiscating, trundling thousands to the guillotine–rose up in 1789; and its end is not yet. Charles-Augustin Sainte-Beuve, somewhere in his Causeries du Lundi (Monday chats), tells of a Parisian playwright watching from his window a ferocious mob pouring through the street below. “See my pageant passing!” the dramatist exclaims. The imaginary happenings represented on the stage have indeed worked upon the fancy of a mercurial public already excited by social disruption; and so the pageant has taken on flesh in the streets, probably for great harm. The French Revolution itself, in no small part, was produced by the idyllic imagination of Rousseau and other visionaries of the Enlightenment. It would be possible to show how the fiction of Rousseau, Voltaire, and other French men of letters had revolutionary consequences in fairly short order. But I am concerned in this essay with reflections of the Revolution–and particularly of Jacobinism–in English and French fiction after the event. It was Edmund Burke who won in Britain the political battle against the Revolution in France. He also won the literary battle against the Revolution. His Reflections of the Revolution in France, with its splendor of rhetoric, gained back the Anglican clergy from their revolutionary inclinations. It–and his later writings–woke the imagination of Britain’s rising poets and philosophers. “I attest of Britain’s rising generation!” Burke cried at the end of his prosecution of Lord Warren Hastings. Indeed, the rising generation applauded him. 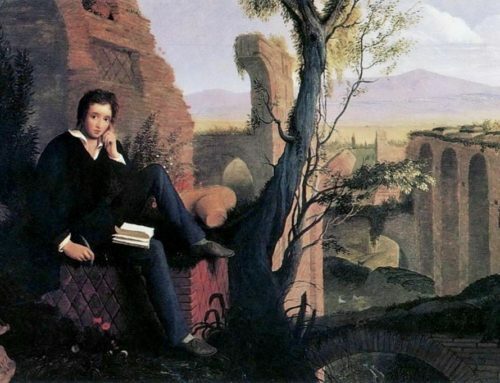 Coleridge, Southey, Wordsworth, and Scott began to expound Burke’s thought in poetry and the novel. Directly or indirectly, Burke’s understanding of the French Revolution was transmitted, with the passing of the decades and long after Burke’s death, to major authors of poetic and prose fiction, and, through those writers, into the minds of the reading public, even unto the present day. For lack of space, I confine myself here to the influence of prose fiction upon British and American public opinion. The four mean of letters I am about to discuss, in chronological order, are La Harpe, Dickens, Hugo, and Conrad. We commence with a jeu d’esprit of Jean Francois de La Harpe, a satirist, playwright, critic, friend of Voltaire, and mocking atheist–until the Revolution. A supporter of the Mountain and other extreme revolutionary groups in 1792 and 1793, La Harpe came to repent his radicalism, for he was flung into prison in 1794. In this peril he became an ardent Catholic, a champion of the old order, and a disciple of Edmund Burke. Among his papers, when he died in 1803, was discovered what Sainte-Beuve calls La Harpe’s best work, The Prophecy of Cazotte, which is fiction with elements of truth. In it, La Harpe employs as his mouthpiece Jacques Cazotte, a mystical author of romances and one of the brotherhood of the Illuminati. A very real person, Cazotte had declared that he possessed the gift of prophecy; he was guillotined in September 1792. Here I give you this fictitious but fulfilled prophecy of Cazotte, in précis by the historian Hippolyte Taine of La Harpe’s fable. It seems to me as if it were but yesterday, and yet it is at the beginning of the year 1788. We were dining with one of our confreres of the Academy, a grand seignior and a man of intelligence. The company was numerous and of every profession, courtiers, advocates, men of letter and academicians; all had feasted luxuriously according to custom. At the desert, the wines of Malvoisie and of Constance contributed to the gaiety a sort of freedom not always kept within decorous limits. At that time society had reached the point at which everything may be expressed that excites laughter. Champfort had read to us his impious and libertine stories, and great ladies had listened to these without recourse to their fans. Hench a deluge of witticisms against religion one quoting a tirade from “La Pucelle,” another bringing forward certain philosophical stanzas by Diderot… and with unbounded applause. The conversation becomes more serious; admiration is expressed at the revolution accomplished by Voltaire and all agree in its being the first title to his fame. “He gave the tone to his century, finding readers in the antechambers as well as in the drawing-room.” One of the guests narrates, bursting with laughter, what a hairdresser said to him while powdering his hair. “You see, sir, although I am a miserable scrub, I have no more religion than anyone else.” They conclude that the Revolution will soon be consummated, that superstition and fanaticism must wholly give way to philosophy, and they thus calculate the probabilities of the epoch and those of the future society which will see the reign of reason. The most aged lament not being able to flatter themselves in a reasonable prospect of seeing it, and especially do they congratulate the Academy on having paved the way for the great work and in having been the headquarters, the center, the inspirer of freedom of thought. All this came to pass, as you know; and Cazotte himself, in 1792, despite his daughter’s noble efforts to save him, fell to the guillotine. Truly, truth is stranger than fiction. The penitence of sometime revolutionaries like La Harpe was not lost upon English men of letters, particularly not on Charles Dickens. When I was a schoolboy, A Tale of Two Cities was studied in most American high schools; more than anything else, it formed young people’s minds concerning the French Revolution. Charles Dickens’ mind on that subject had been formed by Thomas Carlyle’s famous book on revolutionary France, published twenty-two years earlier. In 1858, when A Tale of Two Cities was published, Dickens was a radical, by English standards. He was deeply concerned, as was Carlyle, for the condition of the poor; and, again like Carlyle, he aspired to clear away old abuses and archaic clutter in the civil social order. But Jacobin radicalism, fiercely ideological, repelled him–it was inhumane, sacrificing men and women to political abstractions. Englishmen in general do not take to ideology, being empirical in their politics; and nobody was more English than Charles Dickens. Once Sansculotte has burst forth, however, Dickens tries to keep him at a distance. Defarge of the wineshop, cannoneer at the storming of the Bastille, is hating and hateful, though retaining some affection for his old master Doctor Manette. Madame Defarge, of the knitting needles, is quite merciless; and the portrait of Jacques Third, Defarge’s henchman, is that of a monstrous sadist, “with his cruel fingers at his hungry mouth.” The scenes of the terrorists frantically sharpening their weapons in the courtyard by the bank, and of the bloodstained crew dancing the carmagnole through the streets, stick in the memory of every reader of the novel. Jerry, the bank porter, whose nocturnal trade is that of grave robber, is horrified by these slaughtering ideologues. Their example converts him to better ways, rather as prison and the sight of the guillotine converted La Harpe to Christianity and royalism. Dickens finds no revolutionary worthy of the least praise. His hero is a debauched lawyer, Sidney Carton, who musingly repeats to himself, “I am the resurrection and the life, saith the Lord: he that believeth in me, though he were dead, yet shall he live: and whosoever liveth and believeth in me, shall never die.” And when Carton lays down his life for his friend–or for his friend’s wife–there come the moving lines: “It is a far, far better thing that I do, than I have ever done; it is a far, far better rest that I go to, that I have ever known.” And then the blade of the guillotine falls. Ninety-Three is not a novel about the French Revolution….The theme of Ninety-Three— which is played in brilliantly unexpected variations in all the key incidents of the story, and which is the motive power of all the characters and events, integrating them into an inevitable progression toward a magnificent climax–is man’s loyalty to values. Hugo, by 1874, had grown sympathetic to the Terror of 1793. Early in life, Hugo had been a Catholic and a royalist, so reared by his mother. Under the influence of his father, a soldier, he became first a Revolutionary partisan and then a Bonapartist; in his middle years, he had thought the Terror a blot upon the Revolution. But by the time he wrote Ninety-Three, Hugo had come to think that the Terror had been necessary, and even praiseworthy, as a means of breaking the old and ushering in the new. The course of French politics during Hugo’s lifetime, and since his death in 1885, has scarcely justified Hugo’s notion that breaking with the past must bring on a future of general happiness. Ninety-Three is a novel of ideology. It is set in the forests of Brittany, where the peasants held out to the last for church and king, against the columns of soldiery dispatched from Paris by the Jacobins. On the one side is the Jacobin ideology, in the person of Gauvain, an idealistic young nobleman who has embraced the Revolutionary cause. The same ideology is also found in the much grimmer person to Cimourdain, a former priest who has discarded religious faith for ideological fanaticism–a type not unfamiliar in the year 1989. On the other side is a kind of legitimist ideology, represented by the fearless and merciless Marquis de Lantenac, eighty years old, a fanatic champion and would-be restorer of the Old Regime; indeed, of feudalism. The marquis is the head of a great Breton housel; Gauvain, his opponent in the field, is the Marquis’ nephew. And Cimourdain, a former priest–what we would call now a political commissar, dispatched by Marat, Danton, and Robespierre to keep a jealous eye on the young military genius Gauvain–the complete ideologue, has been Gauvain’s tutor in past years. And although Cimourdain in theory loves all mankind, the only real human being he loves in Gauvain. With the exception of Gauvain, Hugo’s Jacobins are repellent. At the beginning of the second book of Ninety-Three, Hugo makes us privy to a meeting of Robespierre, Danton, and Marat, pinning to them the names of Greek monsters–Minos, Aecacus, and Rhadamanthus. And indeed they are repellent, physically and morally. Robespierre is pale and cold, with “a nervous twitching in his check, which must have hindered him from smiling.” Danton is disordered in appearance, buttonless. “His face was pitted with smallpox, he had an angry frown between his eyelids, a kindly pucker in the corners of his mouth, thick lips, large teeth, a porter’s hand, flashing eyes.” As for Marat, Hugo writes “The small man was yellow, and looked reformed when he was seated; he carried his head thrown back, his eyes were bloodshot, there were livid spots on his face; he wore a handkerchief tied over his smooth, greasy hair; he had no forehead, and a terrible, enormous moth.” Their talk is of exterminating enemies, internal and external; and in particular, of destroying the peasants of the Vendee and their aristocrat leaders. Can Hugo approve of these eminent Jacobins, who have supped so long on horrors? Perhaps–in the sense that they are instruments of revolutionary change, marching toward a secular Zion for all mankind. Can Hugo approve of Cimourdain, who guillotines the one human being he loves, Gauvain? Yes, Hugo can, for the ideologue Cimourdain is what Ayn Rand calls “loyal to values”; Hugo can approve of Lantenac, for the Breton prince also is “loyal to values”–quite different values, of course. Yet Hugo’s heart goes out to the merciful Gauvain, who lets his captive uncle the marquis go free and is himself guillotined for that act. Gauvain has betrayed Jacobin “values” in this clash of loyalties, but he has been true to humane impulses. For Hugo, we must conclude, there lies beyond ideology a supreme value of humanitarianism–also an ideology, though possibly not an Armed Doctrine. As for Cimourdain, after having guillotined Gauvain, he shoots himself: He has been true to his ideological values, but false to human nature. It is interesting that Hugo’s two heroes, the marquis and Gauvain, are noblemen, even though the younger of them believes in an abstract democracy. When the Marquis de Lantenac successfully makes his retreat from the shattered and burning Tower la Tourge, he halts upon hearing the shrieks of a mother and upon seeing the peril of three little children trapped in the burning chateau. He turns back to rescue the children though that act will lead to his capture, his execution, and the ruin of his cause in Brittany. Hugo treats this heroic decision as if it were an inexplicable descent of grace upon the marquis, even though Hugo himself had rejected the Christian doctrine of grade. “The Marquis de Lantenac has been transfigured,” Hugo writes. Similarly, when Gauvain, overwhelmed by the marquis’ generosity and remembering the ties of ancient family, sets his uncle free in defiance of ideology, Hugo can only write, “The sword bearer had been metamorphosed into an angel of light.” Gauvain’s tormented conscience at last tells him to release the marquis, come what may. But why did Gauvain so decide? The reason, though perhaps Hugo did not choose to admit it even to himself, might be expressed in two French words: noblesse oblige. Lantenac and Gauvain were two great gentlemen, endowed with what Burke called “the unbought grace of life,” instructed from childhood to protect children and women. They acted selflessly out of habit and an inculcated sense of duty. Those two died for others; the Jacobin ex-priest, however, killed himself out of devotion to an ideology. A reader of Ninety-Three may extract such a moral from the novel, even though Hugo did not intend to put it into his closing pages. For my part, I did unearth that moral and, ever since, have given loyalty to persons precedence over loyalty to metaphysical politics. Revolutionary though Hugo’s sympathies were when he wrote Ninety-Three, this story is not really calculated to win converts to Jacobinism. The slaughter of the peasants of the Vendee was very like the liquidation of the kulaks in Ukraine by the Bolshviks a hundred and forty years later–and with the same excuse of thus providing for the welfare of a hypothetical posterity. Relatively few readers today are inclined to applaud the columns of troops sent into Brittany by Minos, Aecacus, and Rhadamanthus. (Hugo’s father was among those soldiers of the Republic.) The inflammatory cry of “Liberty, equality, fraternity, or death!” rings somewhat false nowadays. One thinks of Pol Pot, who returned to Cambodia after years at the coffee tables on the Left Bank of the Seine, and raised in his native land that Jacobin cry. Pol Pot succeeded in destroying half the men, women, and children of Cambodia through war, murder, and famine. Our third novel touching on the Armed Doctrine is less known than A Tale of Two Cities or Ninety-Three, but more skillful than either. I refer to Joseph Conrad’s last complete novel, The Rover, of which the setting is the Mediterranean coast of France, near Toulon, during the years 1793 to 1805. It is a good deal to Arlette of the black hair and the red lips; she may have carried a head on a pike herself; at any rate, she had run barefoot in blood through the streets of Toulon when the English forces withdrew and the sansculottes massacred the royalists. Her parents had been murdered there. Then, first as captive and later as frantic participant, she had known all the horrors of those nights of the Terror at Toulon. In the end, she had been carried back to Escampobar by a repellent sansculotte, Scevola, who had been “busy purveying the guillotine,” slayer perhaps of Arlette’s parents, one of the drinkers of blood. Her sibylline aunt, Catherine, had prevented Scevola from making himself master of Arlette and the farm; but he lived with them still. “She is fit for no man’s arms,” said her aunt. He does stay, for eight years, during the time when Napoleon became first consul and then emperor. I refrain here from analyzing the novel’s plot and mention only two episodes that are relevant to the Armed Doctrine. Conrad’s detestation of his creature Scevola is the great novelist’s final expression of contempt for radical revolutionaries–a theme that winds through his earlier novels–Nostromo, The Secret Agent, Under Western Eyes–and some of his short stories. The stalwart pirate from the Indian Ocean is an angle of mercy by the side of murdering ideologues in red caps, those loitering patriots of Toulon. There runs through the page of The Rover a certain weariness, which sometimes seems akin to serenity. Peyrol rests after forty years of adventure at sea; France rests from the ghastly bloodshed of 1793; and Arlette, in love, gradually regains her sanity. The British fleet hangs off Toulon and Hyeres, as if anticipating Trafalgar; but the guns are silent for a time. The Revolution having devoured its children, France can breathe again. Those three novels, and lesser ones, accomplished something to endow English-reading lands, at least, with a healthy prejudice against revolution and ideology. A later wave of books, chiefly by Russian writers of talent–most prominently Pasternak and Solzhenitsyn–has reinforced American and British distrust of belligerent schemes of perfectibility. There has been no American writer of any real merit, since Jack London, who has published novels of revolution–although certainly there was much radical or pseudoradical scribbling in the land during the late sixties and the early seventies, most of it now thoroughly forgotten. Nowadays we publish in this land a great mess of silly or disgusting fiction, but nothing of the literature of revolution–or nothing worth mentioning. Nearly forty years ago, Lionel Trilling expressed the hope that the intricacies of ideology might serve to revive the American novel; we have been spared that. Yet I would be mightily pleased if some talented man or woman should give us novel, a really imaginative one, exposing the follies of ideological infatuation. Any person moved to undertake such a literary labor might do well to commence by reading attentively Burke’s Letters on a Regicide Peace, his brilliant expiring blow against the Armed Doctrine. The Jacobin ideologues of those Letters have their energetic and merciless counterparts today; and if, in Burke’s phrase, the passions of intemperate men forge their fetters, those ideological passions forge fetters for us, too. Books on or by Dr. Kirk may be found in The Imaginative Conservative Bookstore.